no, not here.... I'm only 5 hours and way too much for airline tickets away! OK...maybe some day later on...perhaps for a special occasion or a get away? yep.... like when we've paid off all the credit cards, my daughter's college loans, then it will be a celebration... And you'll have to come over and visit! Yep...know the feeling about airfares. We have to fly really far to get anywhere from our "Rock". Sure!...I haven't been to Kauai in awhile too. Aloha, ladies! 'Sista' knows this but I'm from the islands too; born in Aiea, Oahu in 1949....not a state yet. Told somebody once I was from a territory in the far, far west; they had NO idea what I was talking about. hehehe! I have no family there, but I go on vacation now and then; actually visiting the big island this October. Heading out now. Take care all. I hope you can continue to share your personal photos with the group. These have all been Wonderful photos of your four-legged family members! THIS THREAD WAS CREATED SPECIALLY FOR THOSE THAT HAVE PERSONAL PHOTOS OF THEIR OWN HORSES THAT THEY WANT TO SHARE WITH THE FORUM. PLEASE NOTE: Photos on this thread are from Forum members own photo collections and not obtained from the internet or websites. Is that Disneyland in the first photo? Okay, I'll play- This is a picture of my daughter with my draft, Buddy, before he was retired to us. yes it is, @Especially_Horses. 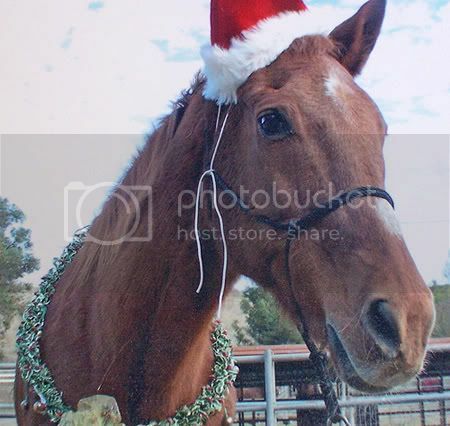 Buddy worked there as a street car/parade horse for 13 years. He was my favorite of the drafts, when I worked there, and made my supervisor promise me that when it came time for him to retire, she'd call me first. She did, and he stayed with us for the last 7 1/2 years of his life. He was 25 1/2 when he died.. He looks like he was the definition of "gentle giant"
I bet I saw him! He may have even pulled the street car I rode in...I always made a beeline for the Draft Horses! Thanks for sharing Buddy with us! you're welcome. He was my soul horse.. Not a day goes by that I don't think of him or miss him. A few weeks ago, I had a dream about him and told my husband and sent this to my daughter "Buddy said hi last night" The next night, she had a dream about him. I received a text from her "buddy came to visit me too". It's comforting to think that. But lord, I miss him so much. Oh, now if you people are going to post tear-jerking comments like the above, i won't be able to read this thread. Bothers my sinuses to be bawling all the time. Sigh. I bet I probably saw Buddy at Disneyland, too. I used to go several times a year as a chaperone on field trips. Thanks much Casey for sharing your story with Buddy. Wonderful to know he was so very special to your family. Trying to figure out a way to share a photo from Picasa album, but all that comes over is the link which I copied/pasted. It looks like I've got to go back for remedial tutoring on the suggestions y'all have given. I love seeing the photos and wanted to share my sweet OTTB, too. how do we post a picture if it is on our computer? 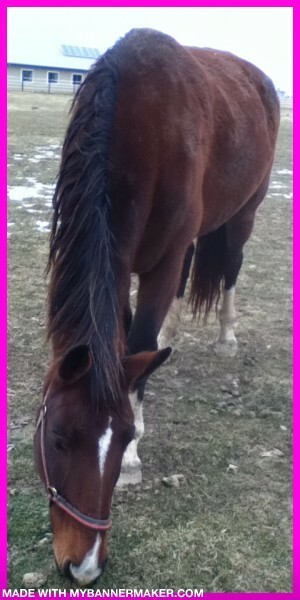 okay so I love seeing all of the pictures of everyone's horses and Casey i loved the story of urs about Buddy. I dont own any horses sadly but I have grown up with them my cousins have three horses of their own so I get to see them quiet a bit during the summer and other times when we are out of school. My grandparents live next to people who are Amish (nothing against them) that own horses and even though I do not know the actual names of the horses like most everyone people want to name animals that they have grown up around just to remember them so there are a couple of names that I have actually came to call certain horses and the funny thing is that the miniature horse gelding actually comes to the name haha its quiet funny. Here are some pictures (sorry i had to make them into banners so i could figure out how to post them). The first couple are of the Miniature Horse gelding who I call Patch, then the other pictures are of some of the other horses the rest are Danish Warmbloods I believe I will check that in a second, the Danish Warmbloods that the pictures are what I call them Diamond & Xina. 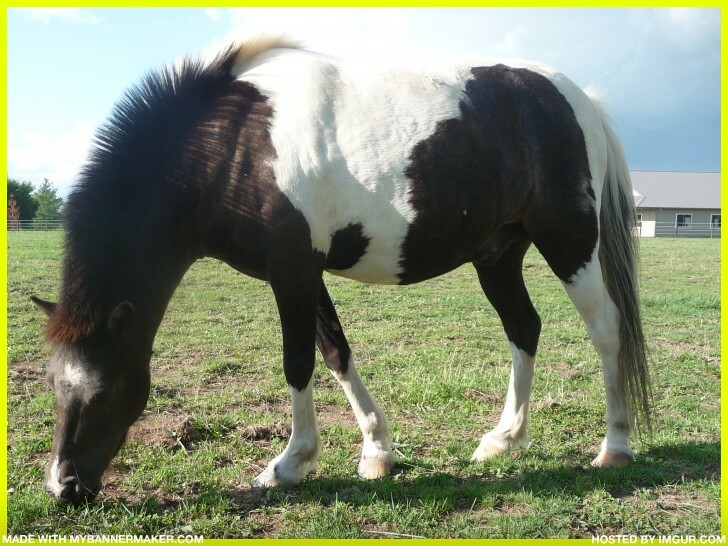 Diamond is the one in the first picture after the pictures of the miniature horse and then the one i call Xina is the picture after that one and then the last picture is of the miniature horse who i call Patch & the Danish Warmblood who i call Diamond. That there is Leapin Lizard, known around the barn as Flair. 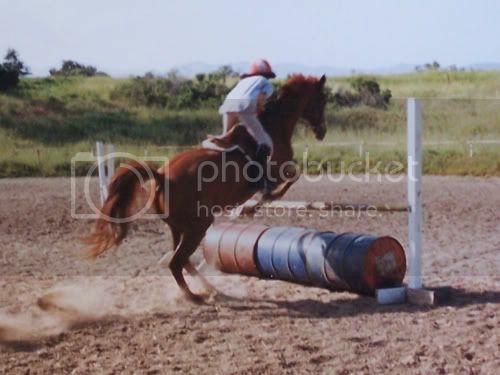 He was my first horse, having been owned by my trainer at the time. 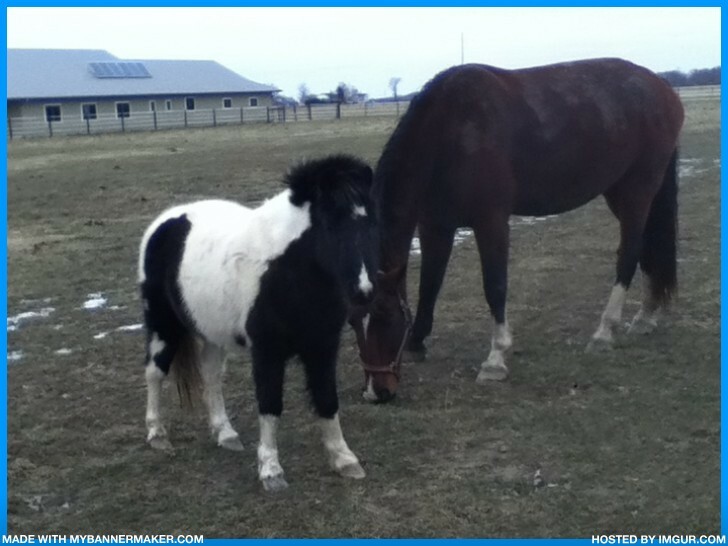 This was after I started to outgrow the pony we leased from her, and needed a bigger horse. She suggested we try him, he was 18 at the time, and not really a schoolmaster type, but he and I took together like ducks to water. We full leased him for a year, and then bought him. The Old Man, as I affectionately called him and I were a team for 12 years. I learned a lot from him, and showed him. We won a lot of classes. Never on the flat, neither of us liked flat classes. I hated them because I never could get my diagonals, he didn't like being in the ring with other horses. Jumping was our forte, and it wasn't just hunters, we did the big stuff. After a few years, he kinda started slowing down. He was in his mid twenties by then, and I stopped showing in junior classes. He was still a lot of fun to ride, and we got into some nice trail riding type stuff. Like going to the beach. That was lots of fun! When he was about twenty-nine, he dropped a lot of weight. I'd been having to have the vet come out to do his teeth every year because he was getting more loose ones that had to be pulled. Normally my vet floats teeth every other year, but the last time he had to have it done, we had to have 4 teeth pulled at once. He was getting on the skinnier side, fewer teeth meant it was harder to chew hay, so my vet suggested we take him off hay and put him on an alternative diet. He was already getting senior feed, but we fed hay pellets and cubes, soaked so they were softer. He fattened up again pretty nice after that. Looking at that last picture, you'd hardly believe he was 30, and still going strong. This was taken a few weeks before his death. He still had a lot of go go go. June 10th, 2014 is the 7th anniversary of his death, but the vet who was attending him when we had to put him down from colic said if it wasn't for the colic, he probably could have lived many more years. But at age 30, I just couldn't put him through the surgery that there was less than 30% chance of him recovering. If he were still with me today, he would be 37. On the other hand, if he was with me today, I would not have the horses that I do. There's Mighty Mitch, my awesome Haflinger. I got him in February of 2008, we very nearly share a birthday (his is the day before, although he's many years younger). I do trail riding with him, dabble in dressage, and his best skill is his cart pulling. I never thought I'd get a rides and drives, but he's the best thing around. And now, I'm only going to have a rides-and-drives (or at least a driving miniature) Driving is the bomb, and lots of fun to do if I can't ride. 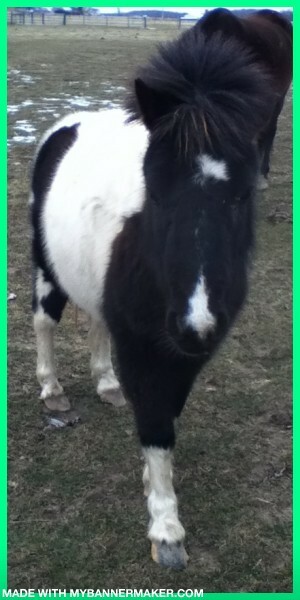 And then I have my Morgan/QH mare, Jet. 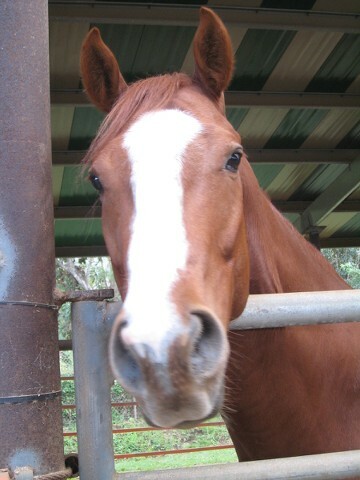 After Flair died, I leased her from July 2007 to December 2007. I went trail riding with her, and gave her lots of love because her owner lived out of town. And then the lease kinda fell apart, it came down to $$ (like it always does) and her owner took her away. Thought I'd lost her for sure, I got Mitch, but never really gave up looking. Lo and behold, 3 years later, almost to the day that the lease ended, I found her on Craigslist with new owners who were more than happy to get me back together with her. She sort of lives in retirement now, I tend to ride Mitch more than her, and I think she's perfectly happy with that. I take her out for walks, and pony her, and I'm training her to ground drive in harness, although I doubt she will ever pull a cart. Being a grade mare, without papers, I don't know her exact age, which I estimate to be late teens to early twenties (which is still plenty young, but she's had some back and lameness issues in the recent past and I'd rather just let her enjoy life) She's supposedly had 2 foals, but I decided I'd never breed her. I used to do riding lessons but that was when i was 8. My aunt had 3 horses, 2 Haflingers and 1 quarter horse. 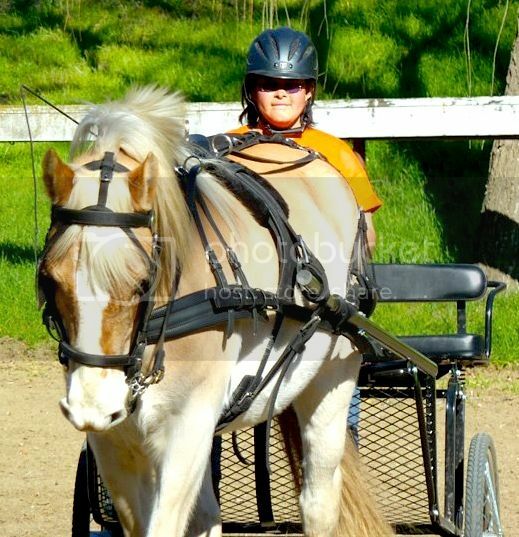 The one haflinger had to be put down cuz he got laminitis but that was her fault cuz he was over weight. 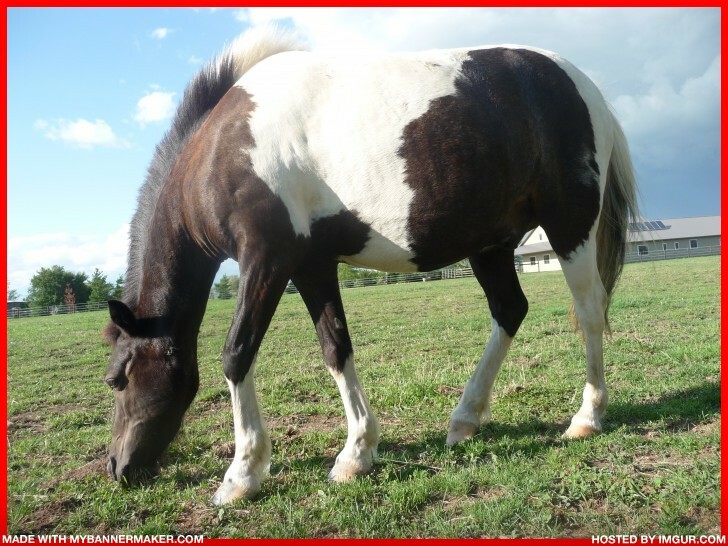 The quarter horse when u rode him he would balk and head for the barn (it wasnt fun). She didnt really do a great job with her horses, she has since given them up. 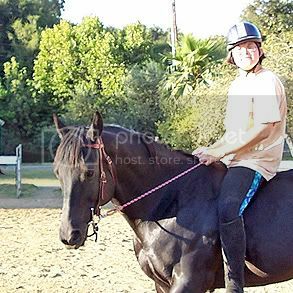 As for the riding lessons, i stsrted off on a small thoroughbred named Polly, she had one blue eye. 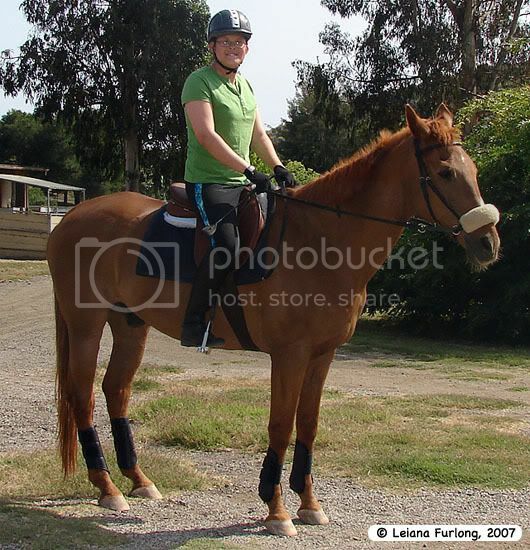 I then worked up the courage to ride Cody, a big thoroughbred chestnut gelding. He was fun to ride. My most vivid memory is when i went to get a stool to stand on so i could brush his back and comb him mane lol. He reared up so high i rushed to the nearest stall to get away lol. Scared the crap out of me lol, i was still 8 at the time. The interesting thing about my riding lesson place is the woman would have u go out to the pasture and hunt your horse down. I had a issue where all the horses would run away lol. Finally caught my horse and had to walk all the way back to the barn, tie her up, groom her, pick out her feet, and go to the tack room and pick out a saddle and all that. The woman instructor wasnt very good at helping really, my mom helped me most of the time. The woman would get frustrated with me. 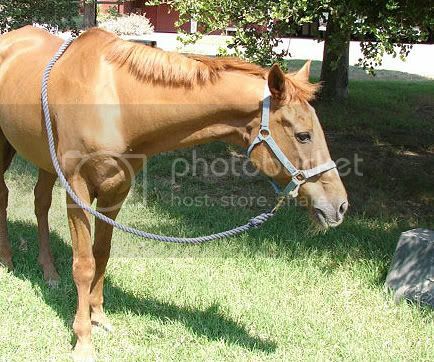 There was one time i had to wash the horse before bringing it back to the pasture and turning the horse out. 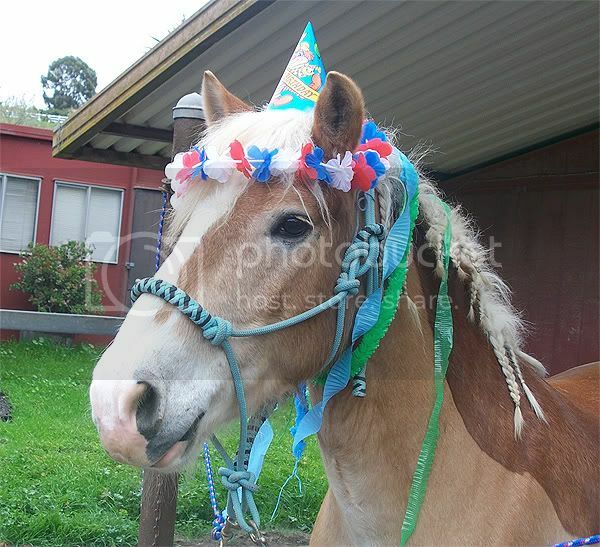 Ive riden a white pony mix at my aunts sons birthday party, that was fun. But, i do not have a horse of my own, nor do i have a place i can go. I cant afford leasing a horse or going somwhere to ride one. I don't own Souffle but he brightens my visits at the stables I go to. 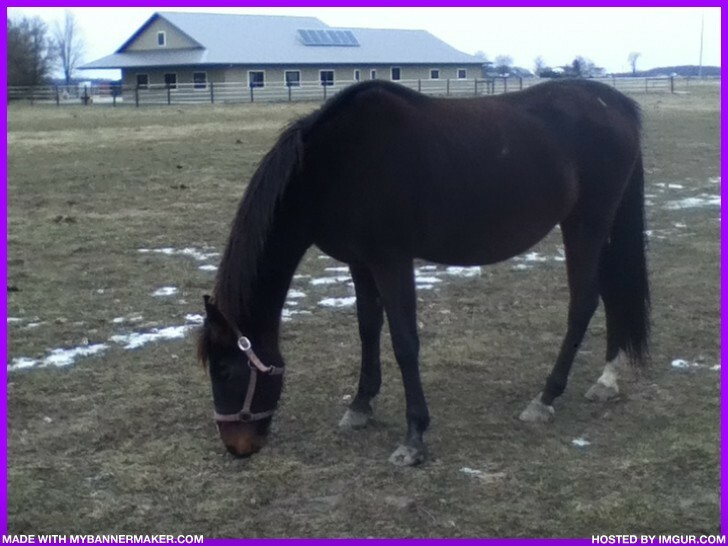 He's an OTTB gelding that stands slightly over 16hh and is now around 10 years old. Souffle is a handsome horse with lots of chrome-high stockings on three of his legs...his looks and presence somewhat reminds me of California Chrome. He's a confident horse and holds his head high and proud! He's friendly, super smart and funny too! 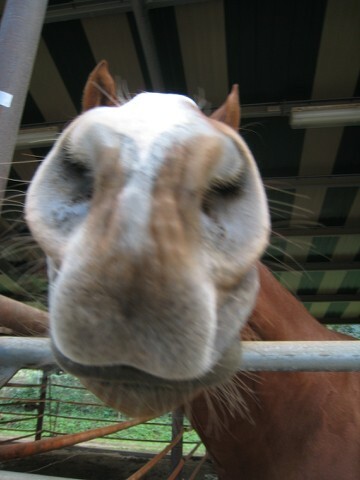 Whenever I come by to see him with treats of carrots, I ask him "Souffle...are you a smart horse?" He responses with a grand nodding of his head. Then one day, my riding instructor wanted to see if he would also nod "Yes" to this question..."Souffle are you stupid?"... With that question posed, he did not nod but gave me a stern look in the eye and backed away as if to say..."How dare you ask me that dumb question!" I immediately said..."Sorry Souffle...I was just testing you...YOU ARE A VERY SMART HORSE!" With that he stepped forward and responded with a nod and a horsey smile....like "Okay you caught me on that one! LOL!" Souffle is also a real gentleman horse. I remember one of the mares had just been separated from her 6-month old filly and was going through a very painful and depressed phase...this was her first baby. She kept calling out for her filly whenever she was turned out in the corral...looking in the direction of the nearby stable where her baby was kept. Souffle who was stalled right next to her was very kind to her as they huddled together. He was nuzzling her and talking kind things to her while she was going thru the weaning process. It was just a touching site with him comforting a grieving mare. Here is Souffle making his interpretation of a Sharpei...LOL!